Did I say ‘start to finish’? After reading through the first few chapters of the manual, it was clear that setup for Choirs would not be a simple affair. It was also clear that reading through the entire manual wouldn’t necessarily give me any better grasp on using the app as a whole. So instead, I decided to take a stepped approach: read a few chapters, get the hang of those techniques, then read a few more. As previously mentioned, the first thing I had to throw out was the concept of plug-and-play. Once the application is installed, the similarity to other sample libraries ends. In order to really take advantage of this app, a second application is used, namely WordBuilder. WordBuilder is the application that allows the user to specify what text is to be sung, as well as the duration and dynamics of the piece. For those who may not grab the concept, it is easiest to think of WordBuilder as an intermediary app – it sits between your input device (usually a MIDI keyboard controller, sequencing or scoring app) and the Choirs Kompakt player. As note information comes in, WordBuilder maps the appropriate sample to each note, taking into account what syllable you wish to play, the duration, the intended sampleset (is it a Bass or a Tenor singing “Aaaaah”), etc. In a way, it is like a MIDI processing unit, adding additional ‘control’ values to incoming notes, and sending out a more complex signal. After plowing through the first few WordBuilder chapters, I decided it was time to get Choirs setup with Logic Pro, my sequencer of choice, so I could really put it to the test. 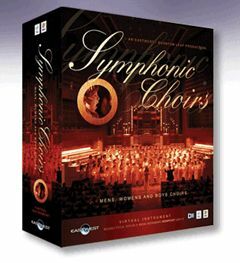 The manual for Choirs goes into detail describing the possible configurations, depending on what operating system and sequencing or scoring application you wish to use. In short, there are three basic setup styles: Stand-alone (the most commonly used setup) works in OS X and XP, with any sequencer or keyboard that sends MIDI on a specific port. MIDI loopback connections are required for most of these configurations. The second setup is VST MA (VST Module Architecture) and works under Windows or Mac OS X for users of Cubase SX or Nuendo (versions 2 and 3). Lastly, they offer MFX plug-in support for users of Sonar., For me, I would have to go the standalone route, diving into Logic’s Environment to configure the loopback ports…or would I? So after flying through that setup, I fired up the SATB template in WordBuilder, which loads the appropriate Soprano, Alto, Tenor and Bass presets, loaded four instances of Kompakt in the Logic SATB template, each with its respective multi sample set (more about those in a later installment), and went back to the manual to come to grips with the heart of Choirs: WordBuilder. WordBuilder consists of two primary components: a text window, where the user specifies the text to be sung, and a duration window, where the user specifies the duration of each syllable. In addition, the user can use one of three types of text input: 1) standard spelling, 2) an easy-to-learn phonetic alphabet, and 3) VOTOX, a phonetic alphabet designed by EW specifically for choirs. I quickly tested out standard spelling and found the results to be less than satisfactory, and since I don’t know the phonetic alphabet, I figured it would be just as easy to learn VOTOX. There’s a handy reference sheet in the manual, so memorizing VOTOX isn’t necessary unless you’re typing a whole lot of text. I quickly ran through some of the included “Latin Phrase” presets – these are VOTOX transcriptions of common Latin phrases used in classical choir contexts. VOTOX yielded a much more convincing and accurate sound, so on to the next step. Unfortunately, the lyrics for Pie Jesu are not among the Latin Phrase presets, so I would have to craft my own text for my first Opus. My first attempt was rather pathetic, so I wont even bother posting an MP3. The syllables transitioned on the incorrect notes and it sounded like a bad virtual choir kind of singing what I wanted them to…but not very well. It was clear that I was dealing with an amateur choir here, and we would need a lot of practice before we were able to sing the whole piece from start to finish. My skills as engineer and composer would be put to the test, and WordBuilder was going to take some significant wrangling to achieve the desired result.